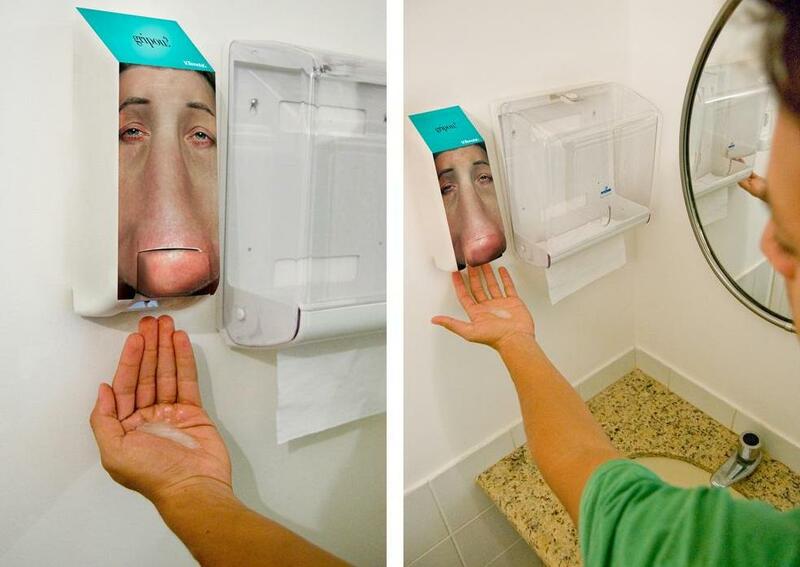 Collection of ‘Most Creative Bathroom Advertisements’ from all over the world. 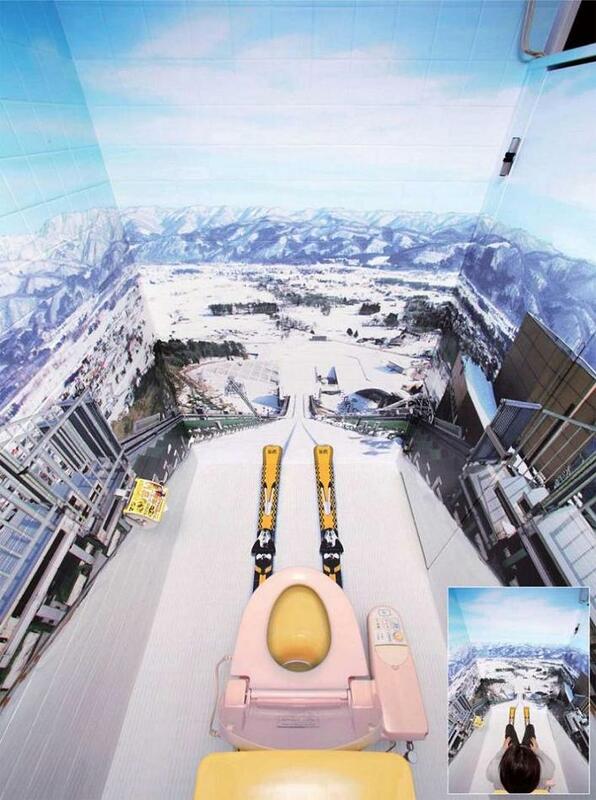 Georgia Max Coffee – Ski Toilets: As a part of the advertising campaign, Georgia Max Coffee redesigned the toilet stalls in major Japanese ski resorts to look like ski jumps to give a feel like being top of the ramp. 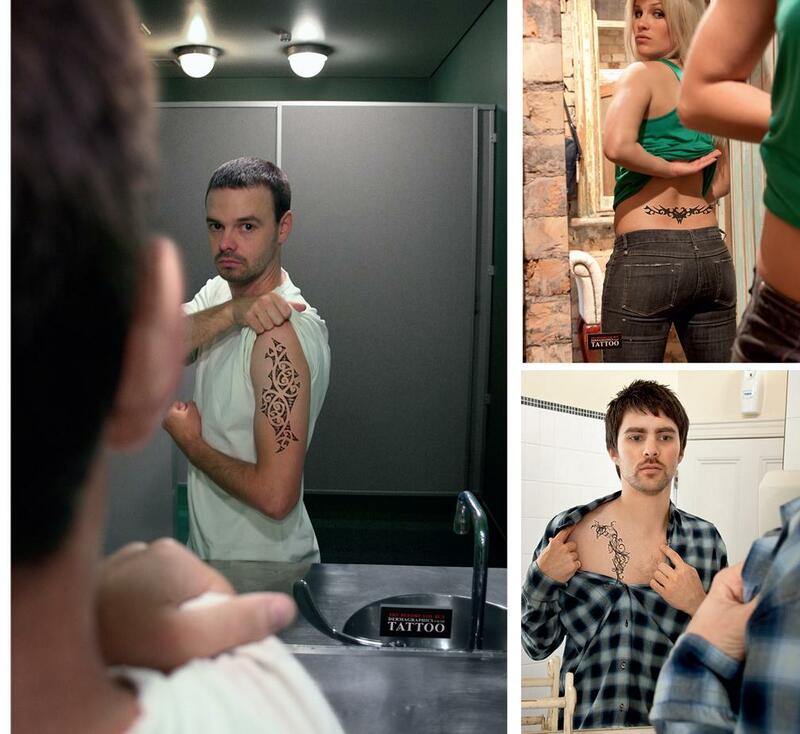 Dermagraphic Tattoo Sticker: Stickers of tattoos were placed in bathrooms and changing room mirrors throughout the city and people could line the tattoos up in the mirror to give the impression that they were actually on their skin. 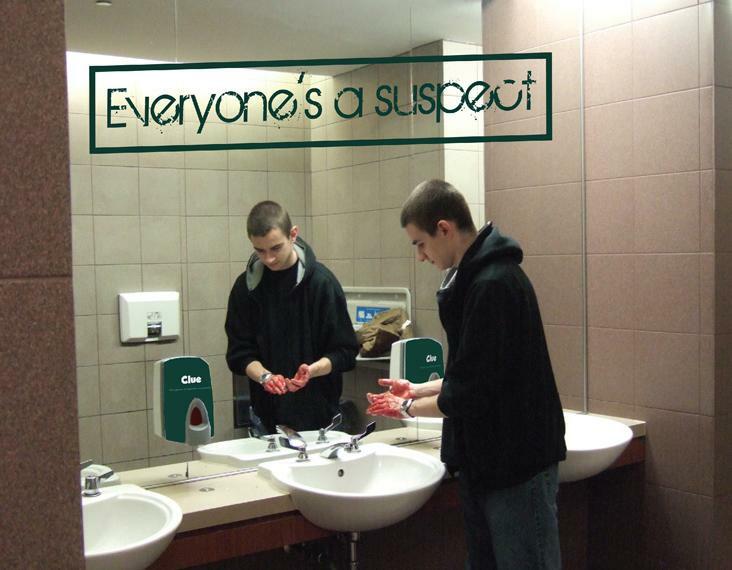 Clue Bathroom Advertisement:Liquid Soap bottles in washrooms in Toronto, Canada were filled with red colored soap along with a sticker on the mirror to promote ‘Clue’. Kleenex Liquid Soap Bottle Sticker: Interactive stickers were placed on liquid soap bottles in mall bathrooms and in toilets at public places. 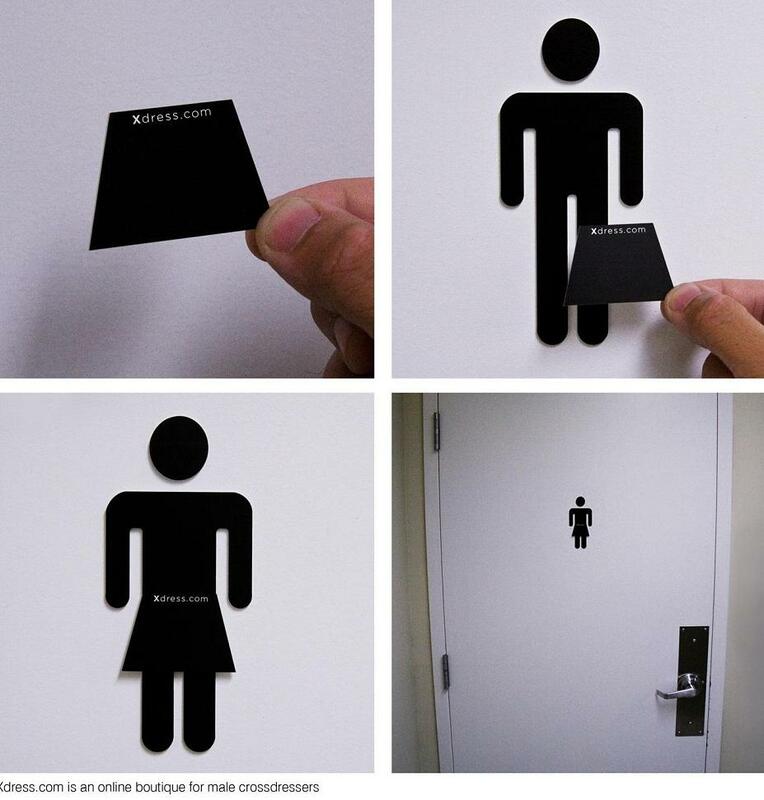 Xdress Washroom Signage: Adhesive dresses containing the site’s URL were created as part of advertising campaign to create awareness about the website. These stickers could easily be applied to public washroom symbols. Tissuepaper Holder Advertisement: The regular tissuepapers were modified using greenfoil, and the silhouette of South America. 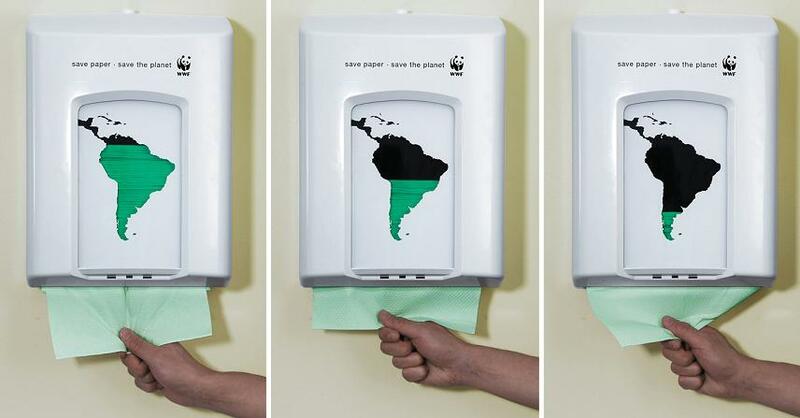 The idea behind this advertising campaign was to make people aware that saving the planet starts with them saving paper. As papers were pulled out it showed the viewers that the survival of our forests is directly connected to how much we use. 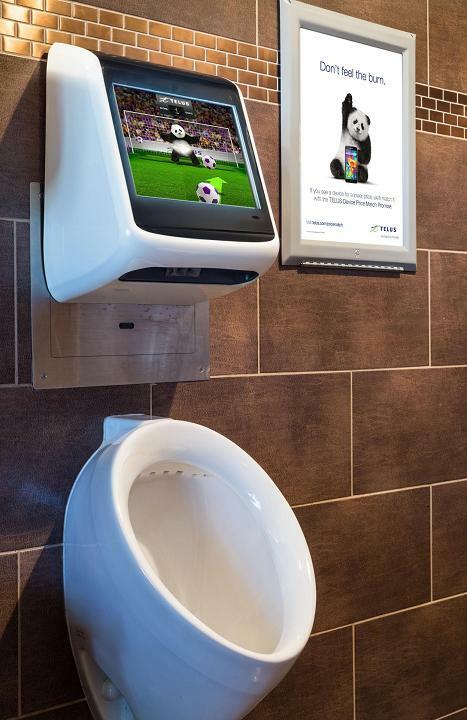 Telus Bathroom Advertisement: To promote the reliability of the Telus 4G LTE mobile network, this advertising campaign was created in Toronto. 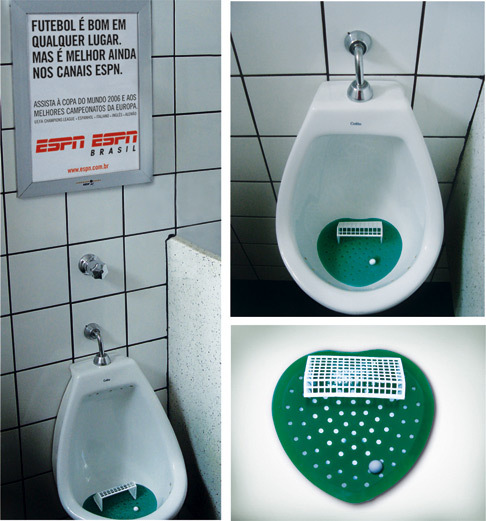 The idea was to make the men’s restroom visit into fun and action packed experiences while they watched the world cup in sportsbars. As men did their business the device activated promoting the Telus 4G LTE mobile network. 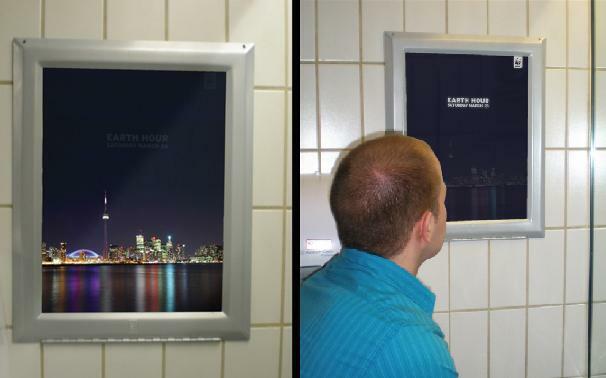 Earth Hour Bathroom Advertisement: To promote the annual support of Earth Hour, illuminated washroom boards were created to run in Toronto. These boards from a certain distance featured a nighttime skyline of the city and as a person approaches the board, the skyline goes dark and the message appears. Natan Jewelry Bathroom Advertisement: An interesting advertisement by Natan Jewelry that did get the attention it was seeking. 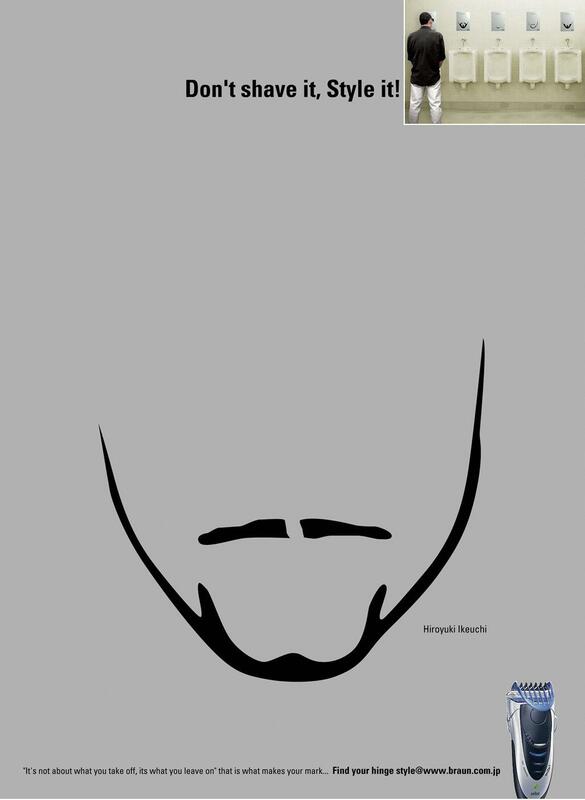 Braun Shaver Bathroom Advertisements: Different styles of beards were strategically placed on mirrors in bathrooms; these gave the impression how the person standing in front of these mirrors would look with different beard styles created using Braun Shaver. 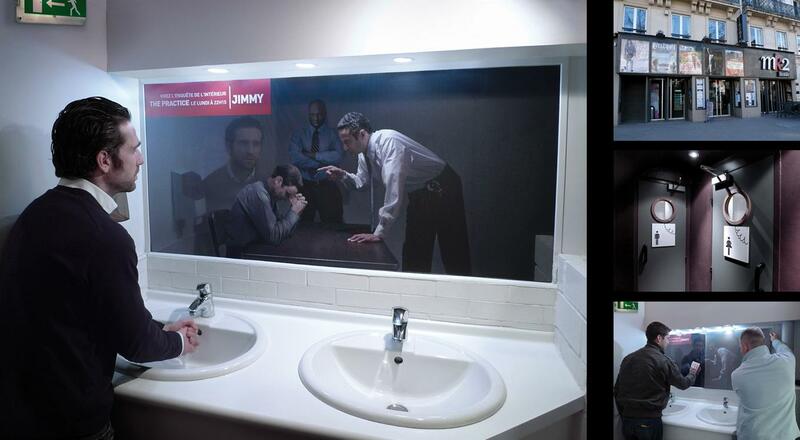 TV Channel Bathroom Advertisement: To promote a TV show, a two-way mirror effect was created in theaters. 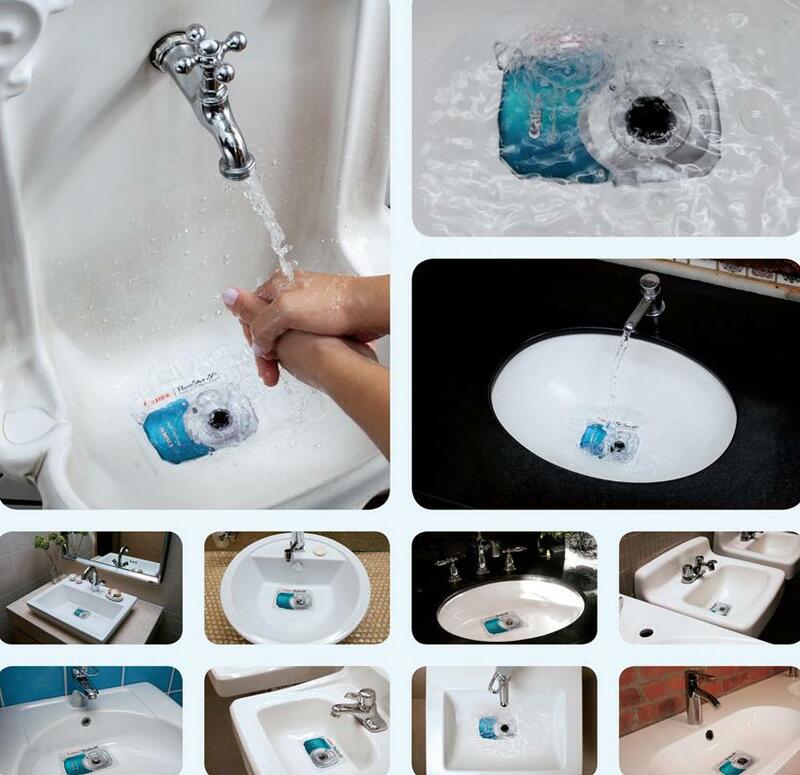 Powershot D10 Camera Bathroom Advertisement: To promote its waterproof camera, stickers were placed in washbasins at shopping malls, restaurants and gyms. Peephole Sticker Bathroom Advertisement: Sticker that was put up in the men’s restroom at most happening places. 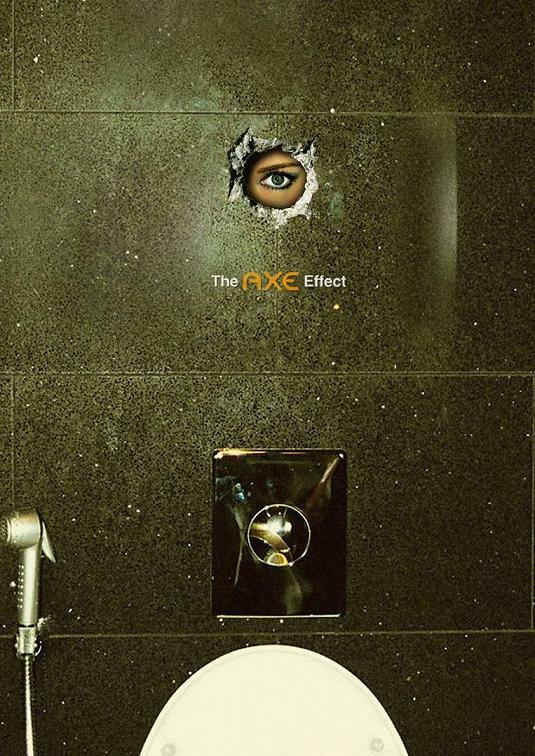 These advertisements were placed on walls and floors in public bathrooms by the South African road safety organization.